Your wear parts have been doing a great job for many tons of production. 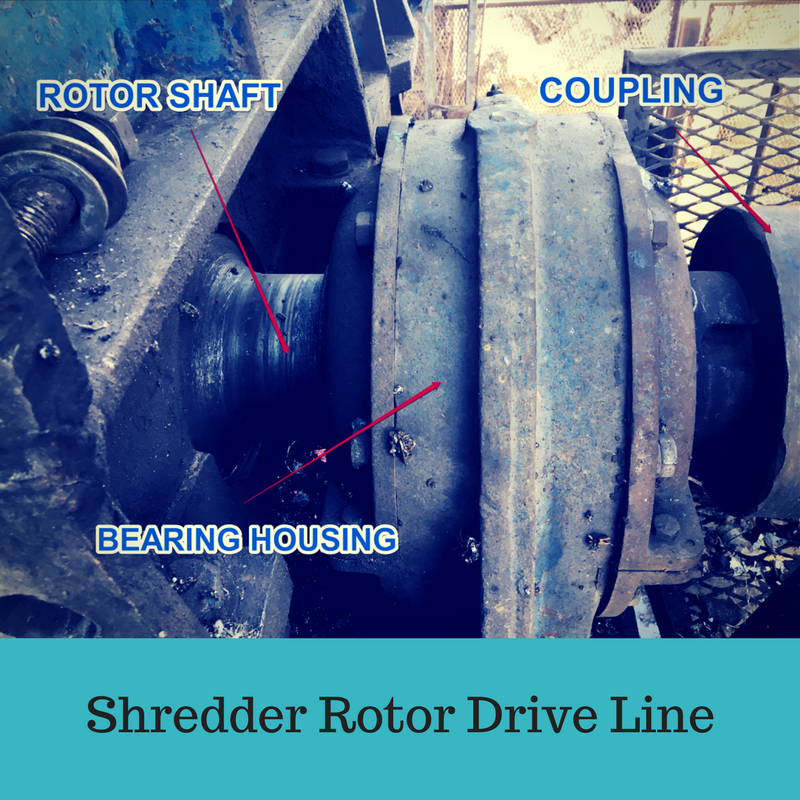 After several years, it’s time to replace your shredder rotor. What are your options and what exactly do you need to plan the job? How do you start finding a replacement? Here’s some information and explanation to get you started. Find your rotor arrangement drawing. The drawing shows the entire rotor and describes its major dimensions, weight, shaft size and general assembly. With this drawing, a rotor builder understands the style and quantities needed to build a rotor. They can estimate materials and general time needed, enabling them to provide you a quote. You need to describe what it is you are buying. A picture is worth a thousand words. 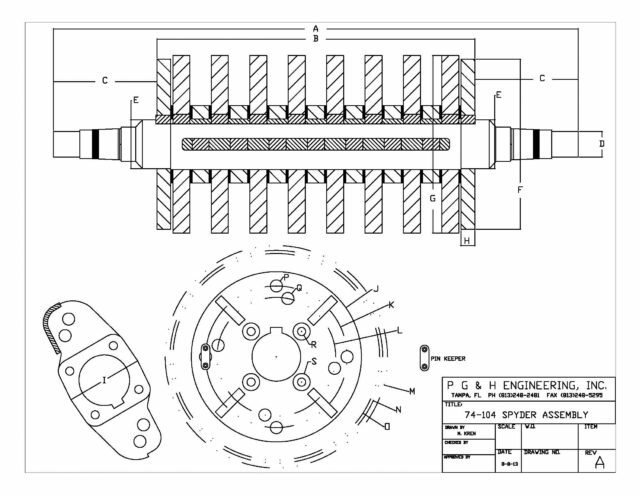 Here is a rotor template drawing from PG&H if you need to make your own. Describe your hammer and hammer pin size. A drawing with some basic dimensions is ideal. If you don’t have one, go to our quote page and download the hammer template you need (such as bell hammer) and use it to describe your hammer. The rotor builder needs to confirm your hammer swing radius, thickness, and pin hole size. 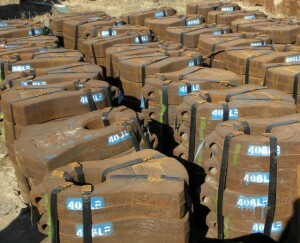 Provide them hammer pin diameter and length. 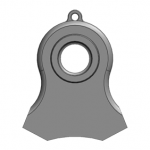 We have a template for hammer pins as well. Get with your operating crew and determine the specific needs at the shredder. Yes, you need a new rotor, but what else? Here are the common replacement items for a rotor change out. These hold the bearings and attach the rotor shaft to the shredder. They get worn and damaged as well. If in good shape they can be renewed. You should have a spare set on hand and can plan to use them. If they have yet to be renewed, get them cleaned up and sent out to a shop that can build them up and machine them to restore a secure fit. Seals keep the lubricant inside the bearings housings. They are long lasting, but always replace with new during a bearing change. Generally spherical tapered roller bearings are used. You should have a spare set on hand. If you need a fresh set, order early as lead times can vary by many weeks. Be sure your spare set is well stored and free of minor rust and dirt. 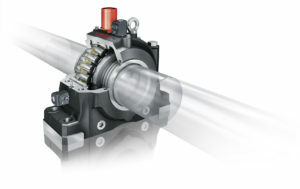 Larger machines have oil cooled bearings, smaller mills may use greased bearings (not needing an oil re-circ system). A means to connect the drive shaft to the rotor. 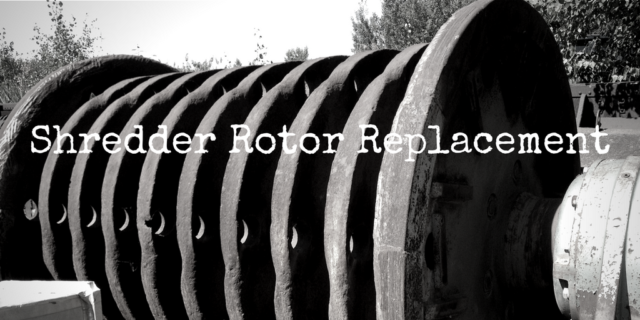 You may be able to remove the old one and reuse it, use a spare, or plan on having a new one made by your rotor shop. You will have the rotor out, so it’s the right time to service your drive shaft. Plan for it. The saddle is the mounting area on the shredder base where the bearing housing sits to anchor the rotor to the shredder itself. These surfaces are subject to wear themselves. The bearing housings should wear first, but in reality, both wear. The saddles will have to be cleaned and ground flat. The bottoms of the bearing housings will be milled flat in the shop. A steel base plate is used when you need to make of the difference in height from the wear of these two surfaces. A shim kit is useful for rotor alignment. It is a set of pre-cut metal shims to help you adjust rotor height when aligning the rotor drive train. Oil cooled bearing generally have a temperature monitoring probe on the bearing oil. Often the probes and wiring will be damaged after years of shredder service. If they need to be replaced, plan for it now. Similarly, your bearing oil delivery system takes abuse over the years. You may need to replace piping or use fresh hose. You might want to get the bearing oil pump & reservoir cleaned and serviced during the rotor change as well. The studs or bolts that hold down the bearings to the saddle base should generally be replaced. Bolts are made to have a certain amount of stretch. Once they have stretched and done their job, they don’t stretch and hold quite the same the next go around. Its a finer point and often, the bolts or studs are often reused. It’s best if you change them. Often the threads and nuts get damaged, so a fresh fastening system is good. After spending so much to replace the rotor, you’re are going to cut corners elsewhere in the installation? Just saying. You have your shopping list. Go find yourself a rotor and replacement supplies. Call you your Original Equipment Manufacturer or one of the replacement builders out there, such as PG&H Engineering. Contact us if you need some advice. Scrap Magazine’s recent issue features a story on shredder wear parts. Wear Part: Makers of Automobile Shredder Wear Parts are Working to Keep Up with changes in Shredder Design, Power, and Feedstock by Theodore Fischer. Ever have a liner break before its normal replacement time? Then when you go to replace it you don’t have a spare? It happens from time to time. First, it’s best to use K2 Castings shredder wear liners, second don’t wear your liners too thin, third, replace loose liner bolts, and fourth, keep your storage area organized so everyone has a clear view of what’s on hand and where to find it. Here are some quick tips on keeping your shredder wear parts inventory working to your advantage. Create a listing of all the wear parts required and quantities on hand to get an accurate starting point. Every time maintenance is performed make sure to record the parts used and deduct it from the original total. It is a simple concept, but very hard to stay consistent. Monthly inventory counts help you avoid surprises. Organize the spare parts area for clear viewing and easy counts. Burying parts on top of one another will make inventory checks difficult. Try to keep your storage area away from the shredder. Sometimes scrap and debris which can cover your parts if they are stored too close to the shredding process. If you have the room, designate a spot for each part and paint the part number on the pavement. This will aid in keeping track by having a visual reference when a part has been used. If you are fortunate to have a building for your parts, you can line them up and hang placards with the part numbers on the wall. Keep used parts in completely different areas to avoid parts confusion. If you are using worn hammers as back ups or pin protectors, weigh and mark them, then stack them on a pallet for easy access. Keep parts rotated using the oldest parts first (FIFO) to keep your wear parts within your replacement warranty time limits. Parts have heat numbers which the foundries keep on file in case there is a possible casting problem. Hope this helps with some simple ideas to keep from getting caught short. Disk rotor scrap metal shredders run with 1-2 hammers in each row and cover the remaining positions with pin protectors. Are pin protectors important wear parts that contribute to wear life? Absolutely. Job one is protecting expensive hammer pins where no hammer exists. They assist in crushing and densifying scrap in the shredder. They help protect the rotor disks, limiting disk wear. They help maintain rotational energy of the rotor. The weight of many pin protectors on the outer edges of the rotor make up the ‘flywheel’ that is your shredder rotor. When new, pin protectors should extend about 2-4 inches past the disk. Disk rotors are more forgiving on balance, but the closer you can match weights of opposing rows of pins and hammers, the better off you will be. Some operators have favored larger protectors as a way to help gain rotating mass and “store” more rotational energy. As with everything, there are limits. Your shredder manufacturer can give you guidance on how much is too much for your mill size, rotor, and drive line. Bottom line, don’t neglect pin protectors. They are not just ‘along for the ride.’ With a little tweaking on size and weight, they can help maintain rotational energy and help save wear on your inner disks as well. Give us a call and let us help you find an edge in improved performance. Scrap metal shredder operators have many hammer patterns and methods for extending hammer wear life. Disk rotors offer more combinations than spider rotors for most operators. Disk rotors come in 10 or 11 disk models, often with 6 pin positions. You can use a 10, 12, or 14 hammer pattern to meet your production requirements. The balance of the openings are filled by pin protectors. Proper rotation of the hammers to different positions is the key to longer wear life and consistent production levels. Some operators rotate in a few new hammers each maintenance cycle and keep mill output consistent. Others run in sets. They rotate edges and positions to achieve maximum hammer wear, then replace the set. Extra hammers on the end positions help move material away from the side liners to reduce wear. Extra hammers in the center position are preferred at times to get more work edges where the action is. Extra hammers benefit mills shredding a high percentage of sheet iron and appliances. If shredding auto bodies, fewer hammers often yield positive results. Too many hammers will impede the ability of scrap to enter the shredder, thus the upper limit of about 14 hammers mentioned earlier. Wear on liners and grates indicate the work area. 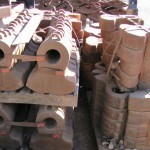 Changing hammer positions can help distribute the material load to some degree. High wear on your inner disks may indicate you are letting hammers and pin protectors wear too long. As mentioned in the spider rotor post, finding your ‘sweet spot” requires a little experimentation and measurement. If you can maintain density and recovery and use less new hammers, you’re moving in the right direction of controlling overall cost. Don’t ignore wear parts life. Casting costs are as real as your electric or fuel bills each month. 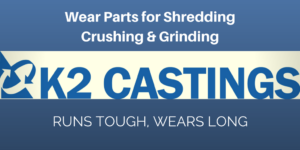 K2 Castings’ wear parts line includes weld on teeth for your scrap metal shredder’s double feed roll (DFR). Maintain a good tooth profile on your DFR rolls to keep your feeder effective and productivity up. Bars and AR Plate teeth work fine, but the edges wear down faster than you’d like. Our weld on teeth provide a strong stable profile. Once welded in place, you can add easily replaceable standard square stock to the tip so you can maintain sharp edges. The profile and edges keep tin and logs moving in, and help hold auto bodies and long stock for a controlled feed into your shredder. Try our DFR teeth. You’ll notice the difference. Contact us today.